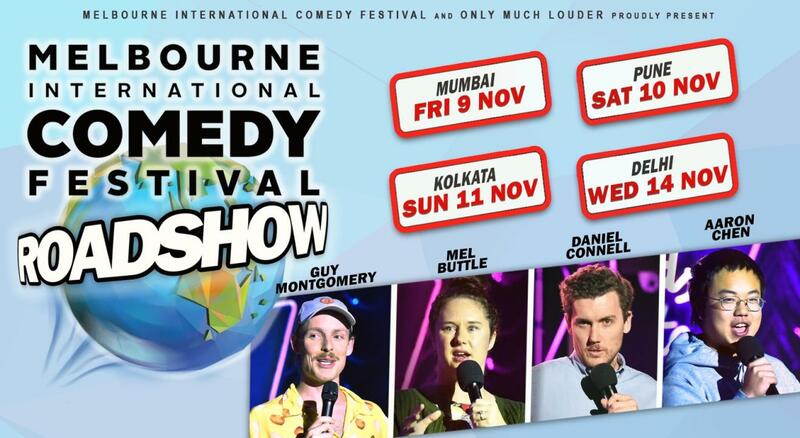 Some of Australia's top comics come to Mumbai, Pune & Kolkata: Daniel Connell, Guy Montgomery, Aaron Chen, Mel Buttle. Tickets and details below. A taste of Australia’s largest comedy festival is coming to India! This vibrant showcase of top performers delivers high-quality, high-intensity laughs in one supremely special show. Hosted by superstar locals and featuring some of Australia’s best comedians. The Melbourne International Comedy Festival has handpicked a line-up that is bold, brilliant and packed with star power. Covering stand-up, satire and all manner of silliness, you’re guaranteed a comedy experience you’ll never forget. Don’t miss your chance to join the laughs in this massive special event, sure to leave you in stitches! Daniel Connell could easily be described as the ideal Aussie comedian; affable, loveable and hilarious. His observational, dry, often unanticipated comedy has seen him take to stages all over the country. Since 2010 Daniel has quickly established himself in Australian comedy scene, often sharing a stage with big-name Australian comedians including Jimeoin, Glenn Robbins, Denise Scott and Dave Hughes. Daniel has performed at the prestigious Melbourne International Comedy Festival Gala, Edinburgh Festival Fringe and on the Melbourne International Comedy Festival Roadshow across Australia and Asia. Guy Montgomery is an award-winning comedian, improviser and screenwriter, best known as co-host of the international smash podcast ‘The Worst Idea of All Time’. (LA Podfest 2015, Now Hear This Fest 2016, over 6 million downloads, features on AV Club, VICE, BBC4, the Guardian (UK) and sold out shows in LA, New York, Portland and San Francisco). A stand-up comedian with a surreal take on the everyday, Guy has won praise and awards in his native New Zealand and across Australia. Guy has featured in Just For Laughs Sydney, the New Zealand Comedy Gala, Melbourne International Comedy Festival, Edinburgh Festival Fringe, and toured with the Melbourne International Comedy Festival Roadshow across Australia. He has been on TV, the radio and the internet, a genuine triple threat. Sydney boy Aaron Chen is a ‘stone cold killer with exquisite mic technique’, delivering fresh, funny and often-absurd comedy. Aaron made his mark in 2017 with his debut solo show entitled The Infinite Faces of Chenny Baby, which toured nationally in front of sold out crowds and high critical praise, including the award for Best Newcomer at the 2017 Melbourne International Comedy Festival and Sydney Comedy Festival. Previous to this Aaron had amassed a collection of awards including Melbourne International Comedy Festival and Sydney Comedy Festival. Previous to this Aaron had amassed a collection of awards including Melbourne International Comedy Festival’s Class Clowns in 2012 and the Director’s Choice Award alongside a couple of other ‘troubled boys’ in 2016. He has supported international comedian Ronny Chieng on his Live Australian Tour, had a featured role in ABC TV’s Ronny Chieng International Student and has also starred in his very own tonight show, aptly named Aaron Chen Tonight. Mel Buttle is a hilarious bundle of contradictions, and she’s a package that is rapidly making herself felt across television and the live comedy circuit. Alongside hit live shows, Mel is a seasoned writer with a weekly column in Queensland’s The Courier Mail and TV writing credits including Please Like Me and This Week Live. Mel has also appeared across Australian TV on programs such as The Weekly with Charlie Pickering and The Project and is a regular on New Zealand’s TV3 weekly program 7 Days. In 2015, Mel found out she can have her cake and eat it too scoring the job of co-host on The Great Australian Bake Off for Foxtel’s LifeStyle Channel.